Tip #1. 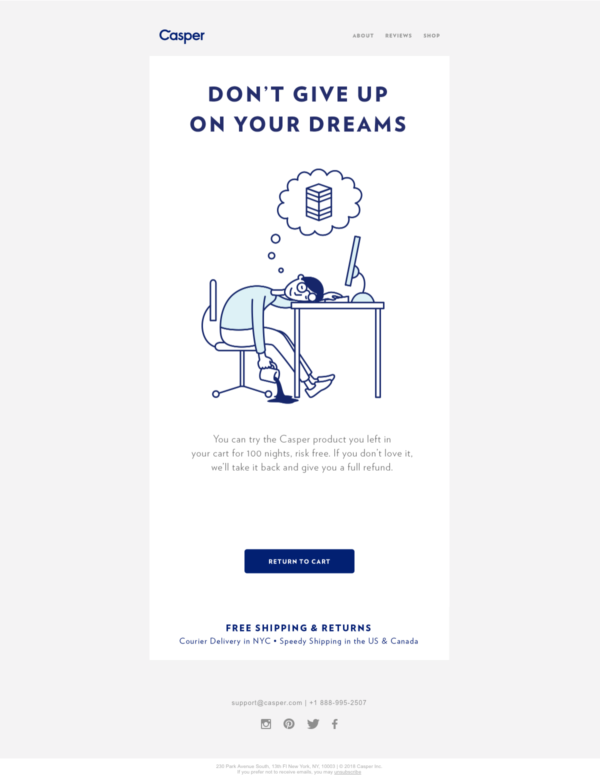 Use 2-Steps emails to bring the user back to abandoned cart. Generally, emails with an abandoned cart are not very different from each other in online stores, but there is a way to make them unique. Add to the first email possible ways to contact you so that the customer may ask any question, and you can dispel his doubts and immediately overcome potential objections. And, of course, it is better to offer several ways to contact you, so that the potential buyer choses the most convenient one for him and could easily finalize the order. If the user has not returned to the cart, you can send a second email, in which in addition to the strong points of chosen goods, you need to emphasize your advantages. You may not be able to outperform your competitor when it comes to a free shipping, a 3-months guarantee and other customer expectations. But, you can use what makes your business unique and remind it to prospects again and again. Often online stores on their sites ask to leave a comment on the quality of their products and customer service, but as a rule, buyers write general and mostly simple comments, especially if it concerns a positive experience. Therefore, we advise you to direct your customers using few questions as a hint so that they can tell you in details about the purchase. And of course, use the feedback in your marketing, as no advertising text will surpass the real customers’ praise. The most part of goods sold online can be good gift ideas. Using search queries like “best [keyword] gifts” and “[keyword] gifts for [gender]”, find sites that can host your products and contact them with a partnership offer. 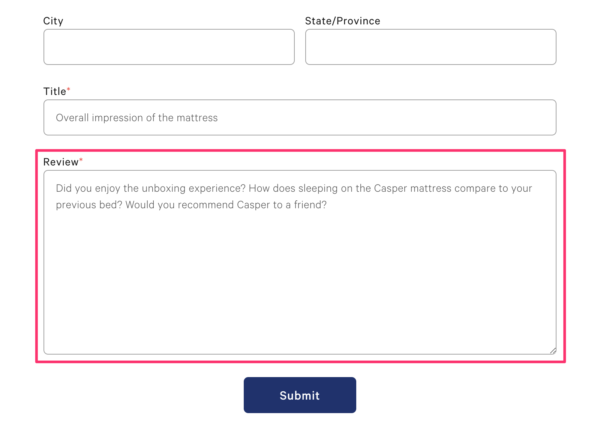 For example, Casper has placed its mattresses on The Knot and Brides’ reputable resources using this strategy. And if you have your own affiliate program, the backlinks from such sites will get many clicks. If you’re using Google Ads to grow your business, you know that you can’t have more than one search ad that sends visitors to the same site at the same time. But there is a little trick which will help to monopolize the results by your most efficient keywords, such as brand requests with the addition of “feedback”. If your products are also available on other sites, then users can be sent onto any of these sites, for example, to Ozon, Google reviews, etc. Also, don’t forget about Google Shopping ads. It will be difficult for the user to ignore your brand if it is presented in three of the four ads that he sees. 3 out of 4 ads lead to Casper products on different sources like Amazon, Google reviews and, of course, the Casper website. “It’s obvious!” is maybe your first answer. But we are going to talk about not the most standard way. Let’s look at the example of advertising on Facebook. First of all, let’s launch an advertising of an article with an interesting title, which is indirectly related to your brand. The link here should not lead to your store site, but to a site with articles or a blog on the subject. 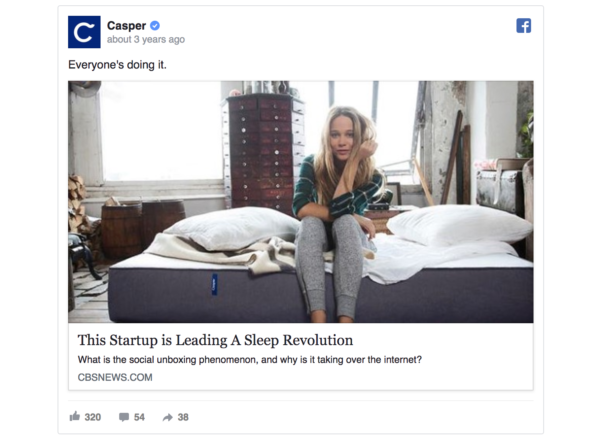 Casper advertises its brand to new audiences through a Facebook ad with a link to a CBS article which is praising their brand. You may wonder: “What is the point of attracting traffic to a third-party site without Call to Action?” While the user is scoring down the Facebook news feed at the same time being already retargeted, he will see your brand ad which will lead him to your site with a Call to Action to buy the goods that the user is interested in. For such a strategy, you will need a partnership with resources that will allow you to place the codes on their websites.